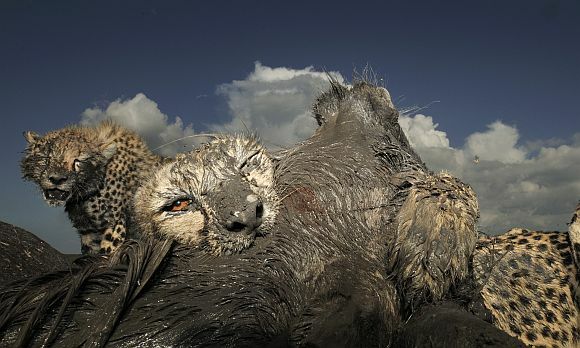 Rediff.com bring to you a selection of some of the photographs that won the Veolia Environnement wildlife photographer of the year 2012 competition. 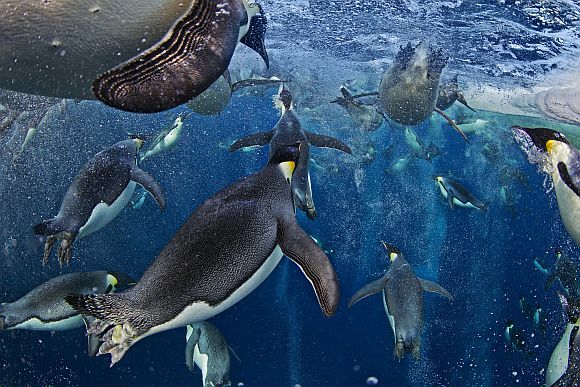 The overall winner was the Canadian Paul Nicklen, with his underwater shot of emperor penguins. About the Image: This was the image Paul had been so hoping to get: a sunlit mass of emperor penguins charging upwards, leaving in their wake a crisscross of bubble trails. The location was near the emperor colony at the edge of the frozen area of the Ross Sea, Antarctica. It was into the only likely exit hole that he lowered himself. He then had to wait for the return of the penguins, crops full of icefish for their chicks. Paul locked his legs under the lip of the ice so he could remain motionless, breathing through a snorkel so as not to spook the penguins when they arrived. Then it came: a blast of birds from the depths. They were so fast that, with frozen fingers, framing and focus had to be instinctive. About the Image: This is a very special tiger. He is one of fewer than 400-500 wild, critically endangered Sumatran tigers. It was a huge challenge for Steve to photograph one, as those that have escaped poaching and forest clearance are mostly confined to patches of forests or the mountains and are extremely shy. A former tiger hunter, now employed as a park ranger, advised Steve where to set up his camera trap. But the challenge remained to position the remote-control camera and the lights in exactly the right position so the tiger would be lit centre-stage in front of a backdrop of forest habitat. 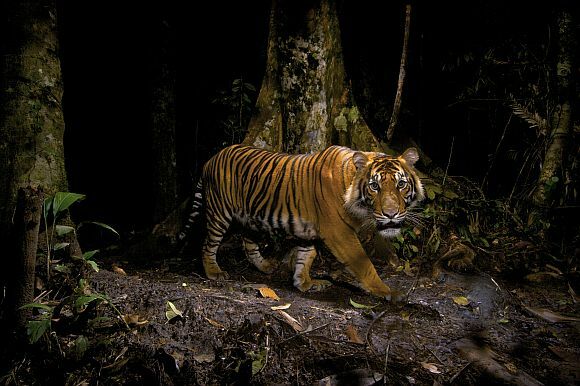 The seemingly unstoppable growth of oil-palm plantations in Sumatra and continuing poaching for body parts for use in traditional Chinese medicine indicate that this subspecies of tiger is destined to become extinct in the wild, as have its Javan and Balinese relatives. 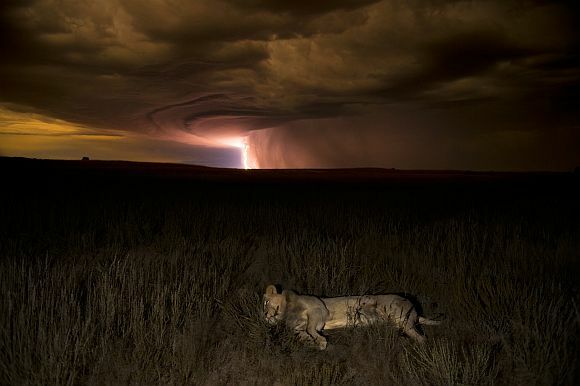 About the Image: This young male seemed blissfully unconcerned by the lightning and thunder rolling in across the Kalahari. Hannes, who was taking night shots in the South African part of the Kgalagadi Transfrontier Park, came across him stretched out beside the track. About the Image: When a female cheetah caught but didn't kill a Thomson's gazelle calf and waited for her cubs to join her, Gregoire guessed what was about to happen. He'd spent nearly a decade studying and photographing cheetahs in the Serengeti National Park, Tanzania, and he knew that the female's behaviour meant one thing: a hunting lesson was due to begin. two days. He would dive down and then sit on the sandy bottom some 20 metres below the surface to watch. 'With the sky behind the fish ball,' he says, 'it looked like a shimmering body of energy. I just needed a focal point to get the picture I was after.' A pelagic cormorant was also watching the fish, and now and then it would shoot a hole through the ever-tightening baitball (tightening in response to the predator), making it easier for it to pick off individual fish. Cristobal tried to predict the angle that the cormorant would use. After many attempts, using a fisheye lens and strobes to illuminate the fish and the sandy bottom, he got the shot. About the Image: Motionless but alert, a yacare caiman waits, 'like a small tyrannosaurus' for fish to come within snapping reach, says Luciano. Caimans are usually seen floating passively on the surface. Under the water, it's another story. It's this secret life that has fascinated Luciano ever since he first came face to face with a caiman while snorkelling. Once he'd recovered from the shock, he realised that the reptile was neither aggressive nor fearful -- and that he could approach it. 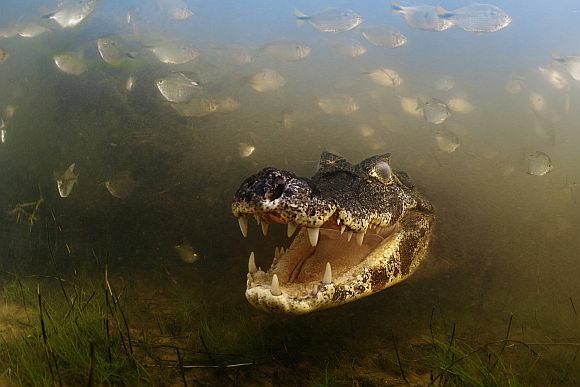 Luciano now regularly documents the underwater life of caimans in the shallow, murky waters of Brazil's Pantanal (the biggest wetland in the world), which contains the largest single crocodilian population on Earth. Caimans can grow to be three metres in length. Most aren't aggressive, but some individuals can be. 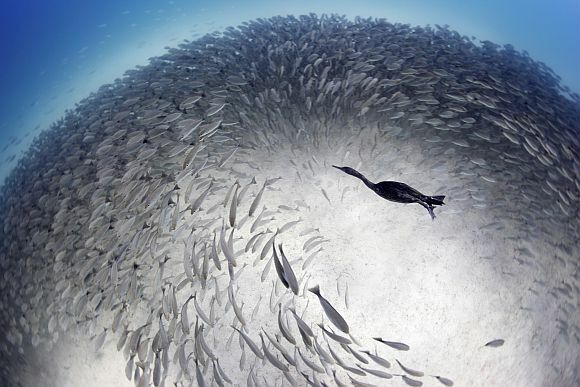 'The safest way to get close is when they are concentrating on a shoal of fish,' says Luciano. 'While I was concentrating on this caiman emerging from the gloom, I had a field biologist with me all the time.' The result was 'the picture that's been in my imagination since my father first showed me a caiman 25 years ago'. About the Image: One evening, while walking along the riverbed of the Myakka River State Park in Sarasota, Florida, US, Larry came across a group of alligators. It was the dry season, and they had been gorging on fish trapped in the pools left behind as the water receded from the river. One big alligator had clearly eaten its fill. 'It wasn't going anywhere in a hurry,' says Larry. 'So I set my tripod and camera up about seven metres in front of him and focused on his eyes.' 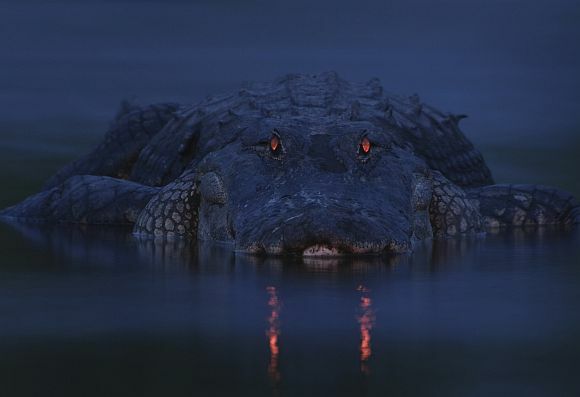 Just after sunset, Larry set his flash on the lowest setting to give just a tiny bit of light, enough to catch the eyeshine in the alligator's eyes. Like cats, an alligator has a tapetum lucidum at the back of each eye – a structure that reflects light back into the photoreceptor cells to make the most of low light. The colour of eyeshine differs from species to species. the longer the reptile, in this case, very long. About the Image: In winter, Japanese macaques in the Jigokudani Valley of central Japan congregate in the hot-spring pools, to stay warm and to socialise. The colder it gets in the mountains, the more of them head for the pools, as do humans. 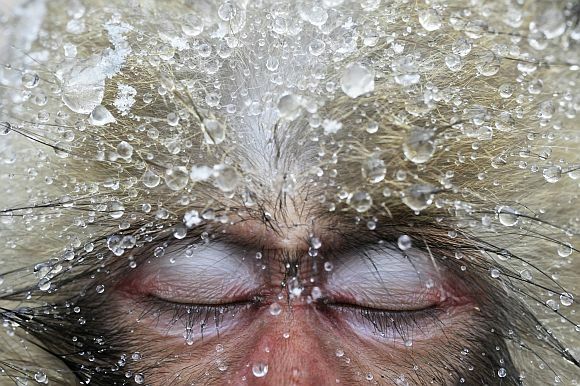 Jasper found about 30 macaques enjoying a steamy soak, their heads covered in fresh snow. 'The warm water has a very relaxing effect on the monkeys, and most of them were asleep.' He watched with delight as this youngster became increasingly drowsy and eventually closed its eyes. 'It's such an honour when an animal trusts you enough to fall asleep in front of you,' says Jasper. 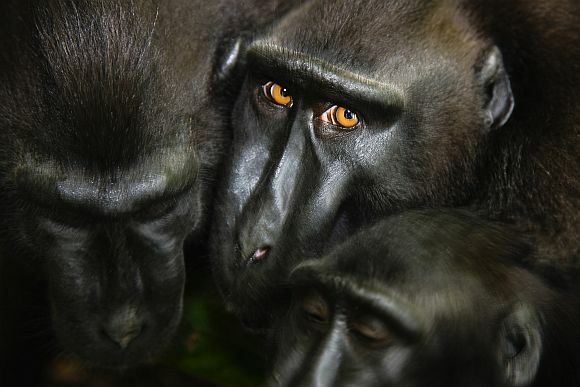 About the Image: Two of the young Sulawesi black-crested macaques entered into a boisterous game with an older, stronger male, involving much ear-piercing shrieking and chasing. Though they were in high spirits, Jami had spent weeks with them and could tell that their play was becoming increasingly heated. When the playmates huddled briefly together, she snatched a close-up shot. But as she did, the older male threw her an intense and challenging look. 'I didn't take this lightly,' Jami says, and she quickly withdrew to a safe distance. Moments later, the older macaque turned rough, and the younger ones scattered, screeching. The real drama is that these characterful primates are at high risk of extinction, both from poaching and forest loss on their Indonesian island home. About the Image: The grey-headed flying fox is the largest bat in Australia -- and one of the most vulnerable. Once abundant, there are now only around 300,000 left. The main threats include loss of habitat, extremetemperature events and human persecution (roosting in numbers, eating cultivated fruit and an undeserved reputation for bearing disease brings it into conflict with people). The bat is now protected throughout its range, but its future remains uncertain. 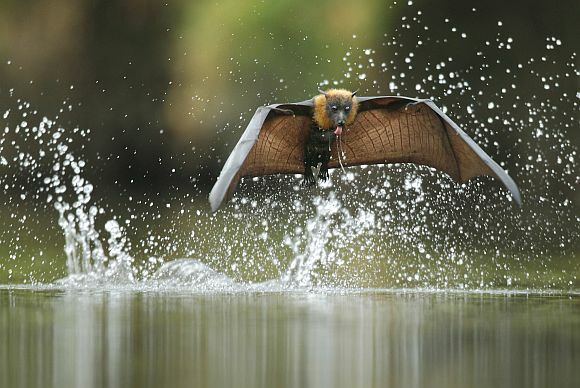 Ofer spent several days in Parramatta Park in New South Wales photographing the bat's extraordinary drinking behaviour. 'At dusk, it swoops low over the water, skimming the surface with its belly and chest,' he says. 'Then, as it flies off, it licks the drops off its wet fur.' To photograph this in daylight, Ofer had to be in the right position on a very hot day, with the sun and the wind in the right direction, and hope a bat would be thirsty enough to risk drinking. Stunning images: Nature at its WILDEST!